ATI Severe-Duty Super Starter 03-up Gen III Hemi All ATI Severe-Duty Super Starter 03-up Gen III Hemi All, ATI Performance Products 915566, 5.7L Hemi Ati Super Starter, 6.1L Hemi Ati Super Starter, 6.4L Hemi Ati Super Starter, 6.2L Hemi Ati Super Starter,Dodge Ram Ati Super Starter,Dodge Durango Ati Starter [ATI Performance Products 915566] - $601.99 : 3rd Strike Performance, Your Source for Late Model MOPAR Performance Parts and Accessories! 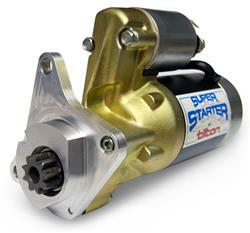 ATI severe-duty super starters pack a lot of power into a compact package--a hefty 3.0 hp, in fact. That's enough to crank over just about anything, and they only weigh about 12 lbs. These starters feature full ball-bearing or needle-bearing construction that's little affected by heat or cold, and most are "clockable" for multiple choices of solenoid positioning.